While the Coast Guard is taking a closer look at its practices, the other military services continue to use thousands of animals each year in invasive training courses—even though human-relevant methods exist. But there's a bill in Congress that addresses this issue—the BEST Practices Act. Please ask your representative to co-sponsor the BEST Practices Act. I have exciting news! Recently, the U.S. Coast Guard confirmed that it had suspended the use of animals in invasive trauma training courses pending an internal review. Previously, during these courses pigs and goats were shot and stabbed. 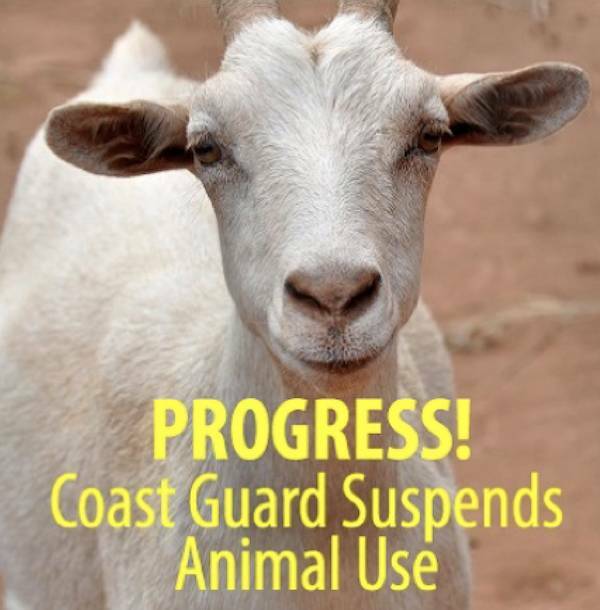 California Congresswoman Lucille Roybal-Allard has been a strong leader on this effort, urging the Coast Guard to replace animal use. She even announced the news in a recent op-ed. But while the Coast Guard is taking a closer look at its practices, the other military services continue to use thousands of animals each year in invasive training courses—even though human-relevant methods exist. But there's a bill in Congress that addresses this issue—the BEST Practices Act. State-of-the-art human-relevant training methods like the Cut Suit can provide better training than the military's current use of goats and pigs. With your help, we will modernize military medical training and end this cruel animal use. Thank you for your help.